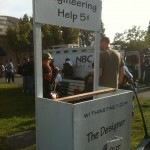 The weekend before last (May 21-22) I attended Maker Faire, the “World’s Larges DIY Festival”, in San Mateo California. 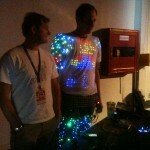 I was proud to be a part of the eTextiles / Wearable Computing Lounge and Showcase. eTextiles and Wearable Computing (which I’ll abbreviate eT/WC from here on) incorporate electronics into fabrics or clothing. See my earlier post for more on what it is and how I came to be interested in this field. The Lounge displayed the works of about 10 or so designers. The Showcase was an eT/WC fashion show, held at 3 pm on Saturday on the ArcAttack stage of the Fiesta Hall. I never imagined myself as a runway model and although it wasn’t exactly like that, I sure couldn’t pass up the opportunity to sachey, chantey! I was happy to meet many interesting and fun fellow designers and see how each of us is taking the technology and creativity in different directions. Very exciting times! Thank you Lynne for making this event happen! In addition to my eT/WC participation, I was gobsmacked just walking around the Faire taking in all the sights, sounds, tastes and thought-provoking ideas! It kind of felt like the county fairs I used to go to as a kid combined with Mythbusters and Mad Max.